There were no weeds in medieval times. And now I know why that magician in my old comic books was called Mandrake. More about that after we’ve done some exploring. . . Step into the cool, subdued light of this medieval sanctuary and you step back to the Middle Ages. 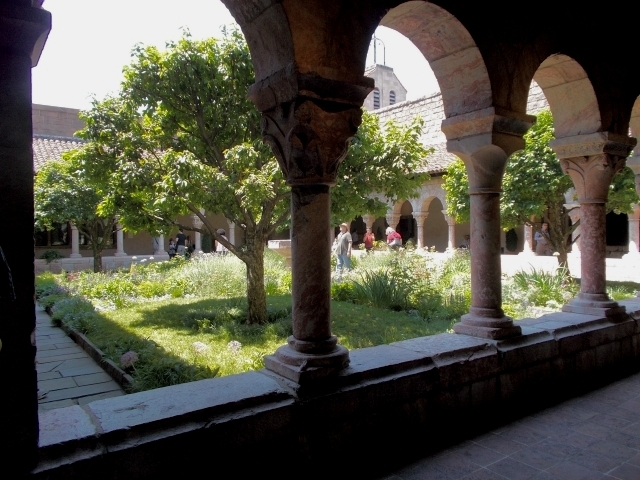 Spend time in these courtyards surrounded by shadowy colonnaded galleries we call cloisters and you picture friars as they meditate or tend plants. We didn’t know much about medieval gardens, so we joined a guided tour. So seamlessly had we stepped into the Middle Ages that we were taken aback when our guide told us this was all a re-creation using ruins and records from medieval times. 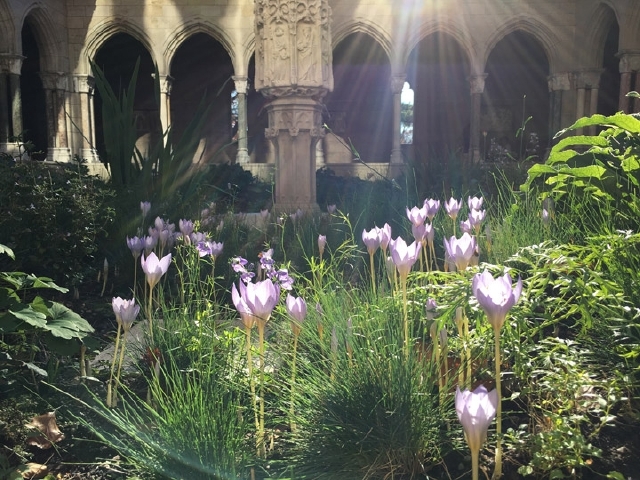 Soon we learned how closely bound everyday life was to plants in the middle ages, and how art and architecture reflected this union. 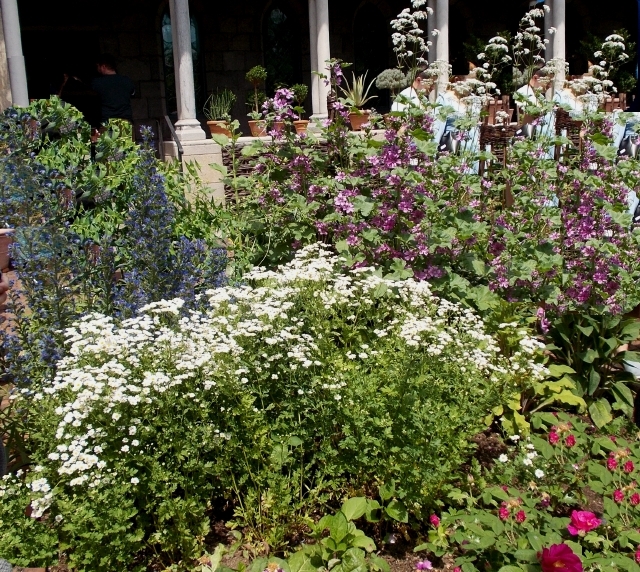 Many plants used in medieval times are plants we treasure in our gardens today. Many we pull as weeds. There is no way we can repay the pioneer herbalists who long ago walked a tipsy tightrope to distinguish the beneficial from the harmful. It’s a sticky way north in Manhattan, but it’s worth the trip. 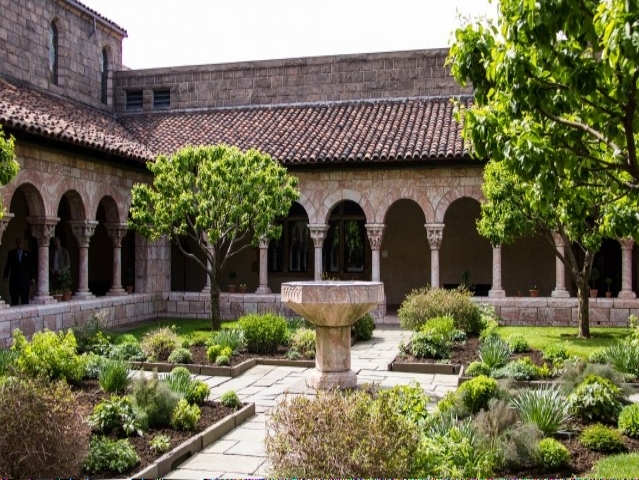 There are three cloisters with gardens in this recreated holy place/museum that looks like a fort perched on a hill overlooking the Hudson River. 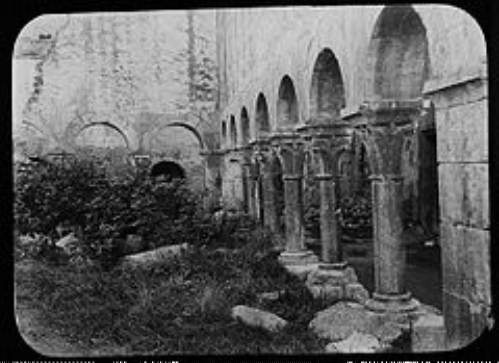 Stone by stone, the ruins of cloisters located in southern France were shipped to America and meticulously repositioned and incorporated into a modern creation of a medieval building. 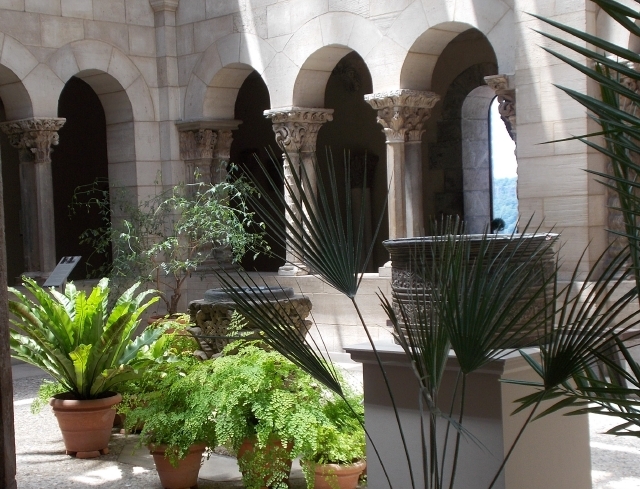 Each cloister garden has its own character. Scant records exist, though early plant lists and writings give clues that horticulturists use as they design gardens. 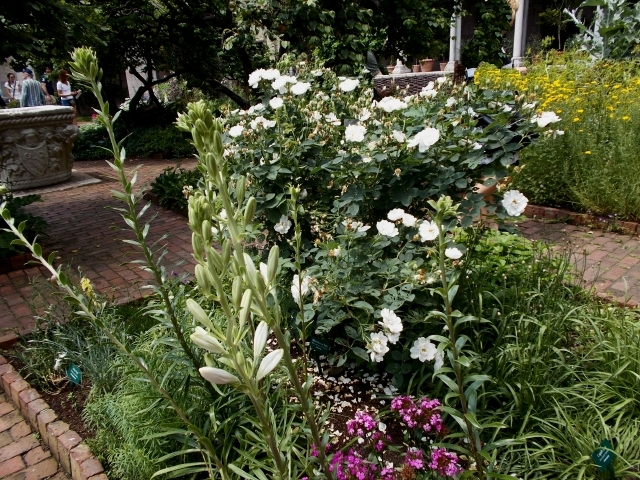 Symmetrical beds of plants chosen for beauty and fragrance intersect the lawn. This is, after all, a Pleasure Garden, designed for strolling. Plants may be well behaved in spring, but you can see by mid-summer they are on-the-bound. 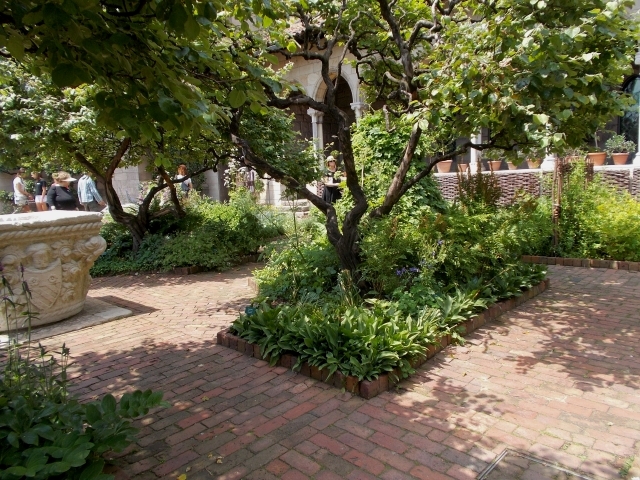 This is the only cloister garden with records of sorts, and these tell of lilies and roses. Today, plants of ancient lineage grow side by side with latter-day hybrids. Crabapple trees anchor each quadrangle. They are pollarded, or hard-pruned annually to control their height and spread. 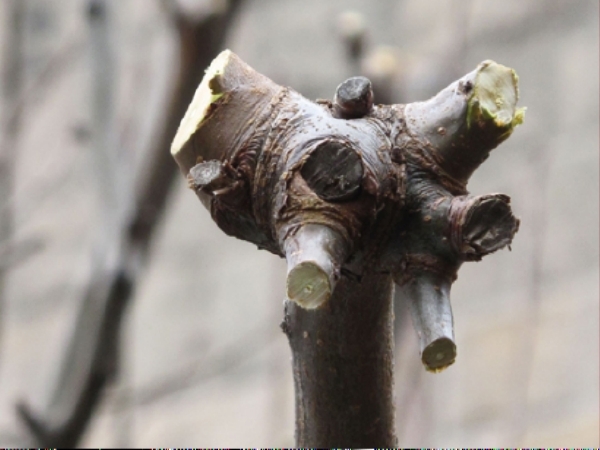 Each year branches are cut at the same place in late winter while the trees are still dormant, creating “knuckles” from which new growth will emerge. Old roses and lilies. Venetian wellhead in the right rear of this photo dates from the 15th century. 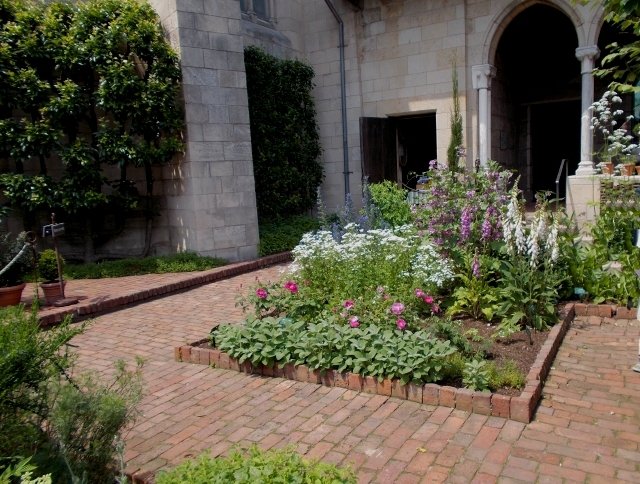 The Bonnefont Cloister Herb Gardens is an herb lover’s paradise. 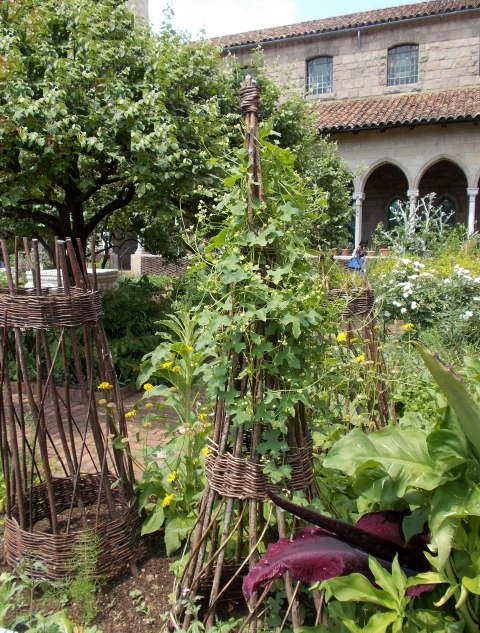 It’s a teaching garden centered on a 15th-century Venetian wellhead with more than 250 species of medieval herbs growing in raised beds based on ancient plans of monastic gardens. Here we learned how wattle fences were made. We met plants that were used in the kitchen, in weaving and dyeing, in housekeeping, in curing illness, and in magic and lore. From rose petals to roots, every plant here has been put to good use. Here is where we met dragon arum (Dracunculus vulgaris), or voodoo lily, or stink lily. Its odor and color imitate rotting meat to attract fly pollinators. And here is where we met the Mandragora, or Mandrake, namesake of the comic-book magician I adored in the 1940’s. Historians today consider Mandrake to be the first of the superheroes. The Magician simply gestured and villains like The Cobra or The Brass Monkey or The Deleter would see illusions and become powerless. 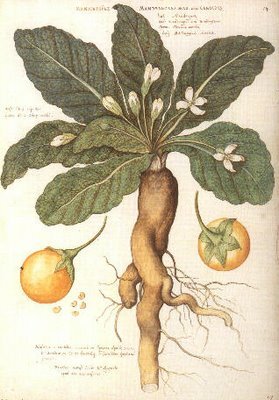 The mandrake is a poisonous plant that can induce spells — hallucinations, delirium, even unconsciousness and death. Superstitions fly. One of them claims that its root system resembles a tiny man, and anyone hearing its cries is subject to death. Remember the ear muffs Harry Potter and Ron wore as they transplanted young mandrakes? 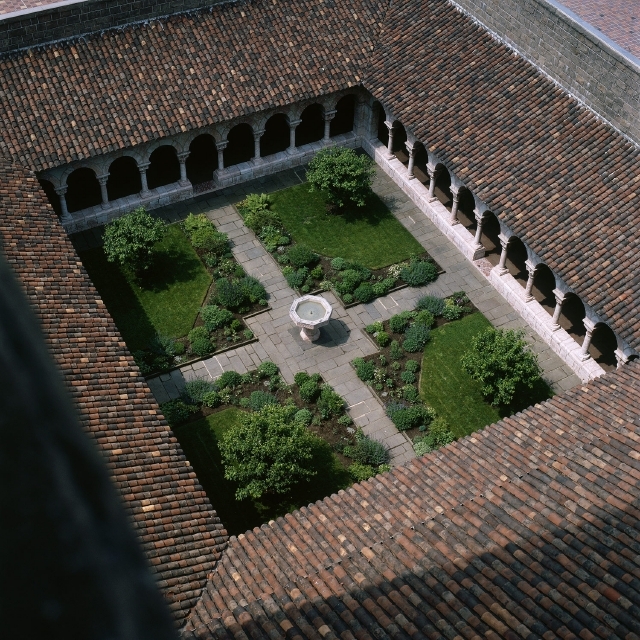 Trie Cloister was once part of an elegant Carmelite convent built during the 14th century. Destroyed by the Huguenots, its ruins were scattered over time and many columns were lost. Interestingly, the white marble capitals illustrate Bible scenes and the lives of saints — and coats of arms. 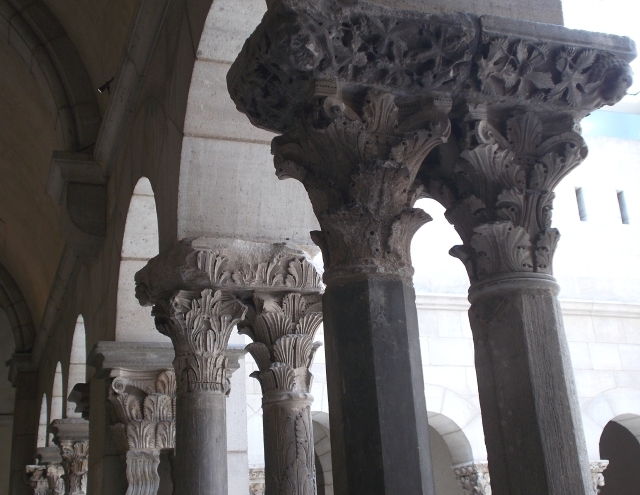 In contrast, the double columns are created from colored marble. 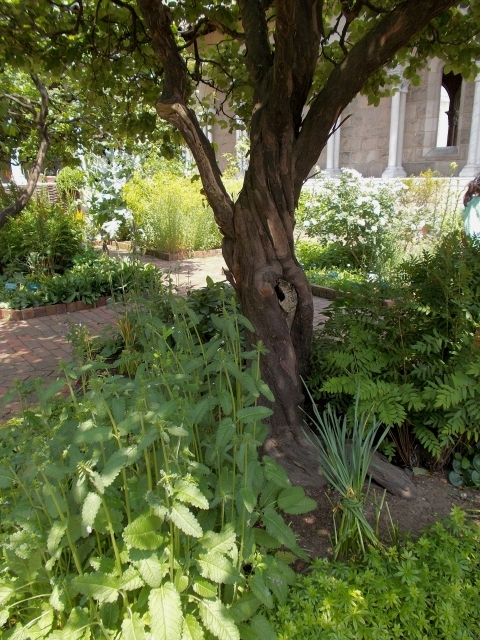 Today, the quadrangle houses a medieval fantasy garden. Order and symmetry, so important to the design of the pleasure garden, take a back seat to splashes of untamed nature and the joys of a virtual medieval eternal spring. The casual design that recreates the flowering meadow, anchored by a marble fountain of latter-day vintage, invites wandering and appreciation of the gaiety. 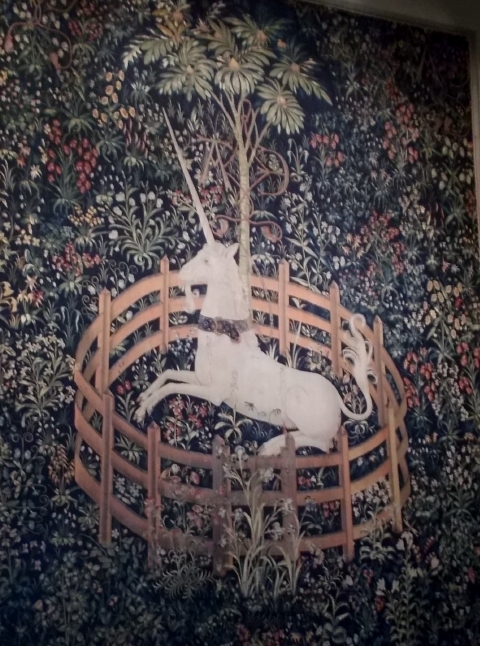 The flowering meadow is a cherished theme in medieval art, and plantings here reflect “meadows” woven into elaborate pieces of art like the remarkable Unicorn Tapestries displayed here. 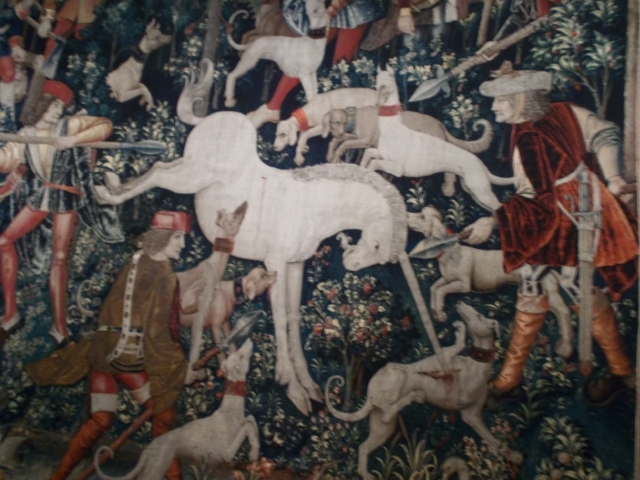 There are more than 50 species of herbs and flowers in the background of the Unicorn Tapestries, where spring flowers and fall berries mingle in artistic harmony. So focused were we on the fate of the Unicorn that we missed this vibrant “meadow” until our guide pointed it out. 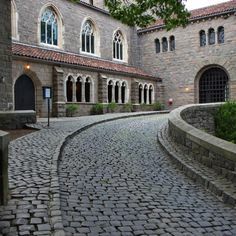 An uneasy alliance between two visionaries, one, a sculptor and antiquities dealer frequently short on funds, the other, a powerful financier and philanthropist, would bring about the rise of the Cloisters. 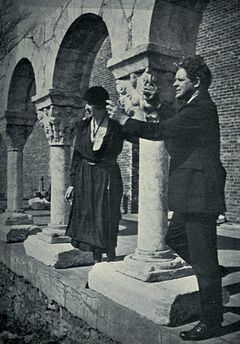 George Grey Barnard, enthusiastic and dashing, searched out monasteries and ruins in Europe during the early 20th century to bring antiquities back to the United States. In time his crowded museum would outgrow his property and its contents would eventually become the nucleus of the Cloisters collection. But I am jumping ahead of the story. 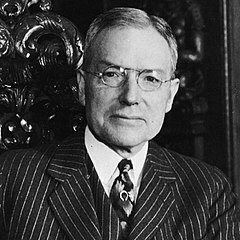 Reserved and powerful, John D. Rockefeller, Jr. was a neighbor of Barnard. Rockefeller was the money man. He bought up lavish estates in the Hudson Heights to create a 67-acre park to commemorate the site of the 1776 Battle of Fort Washington. Then he turned the design of the park over to Frederick Law Olmsted, Jr., son of the great landscape architect who had stretched the horizon on design of green spaces. Olmsted would create a gem of a park on a promontory that soared two hundred feet above the Hudson River with splendid views of the New Jersey Pallisades. 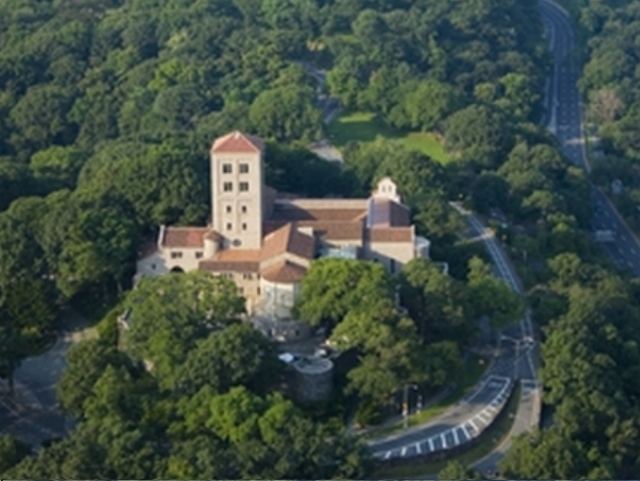 Named Fort Tryon Park, after the last British Governor of New York, Rockefeller donated it to the city in 1935. 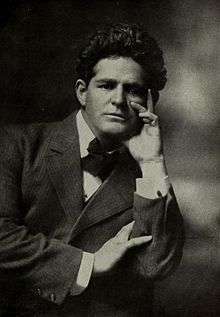 At about the same time, he purchased Barnard’s collection and donated it to the Metropolitan Museum of Art. While the museum was cataloging the artifacts, Rockefeller hired an architect to design a new building: part fort, part sanctuary, part museum. This complex of buildings would incorporate the cloisters and their gardens and other antiquities that Barnard and others had retrieved from France. 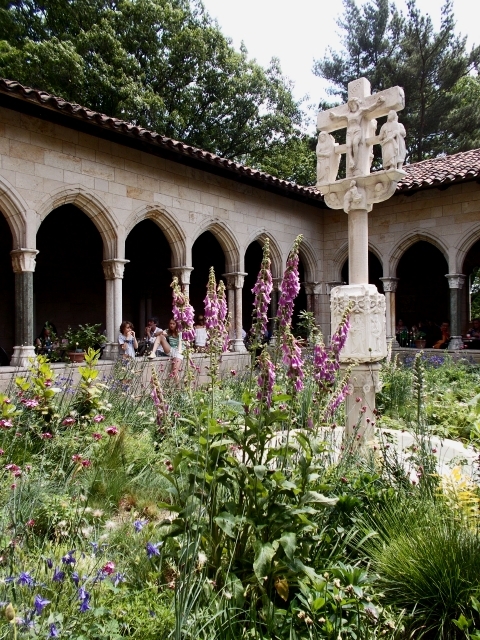 The Cloisters, including the Cuxa Gardens, were dedicated in 1939 and opened to an enthralled public. Work would continue for several years until the museum was completed.